Mushrooms. Forage more than a dozen ­varieties of edible fungus on a two-hour Sonoma County hike with Relish Culinary Adventures. 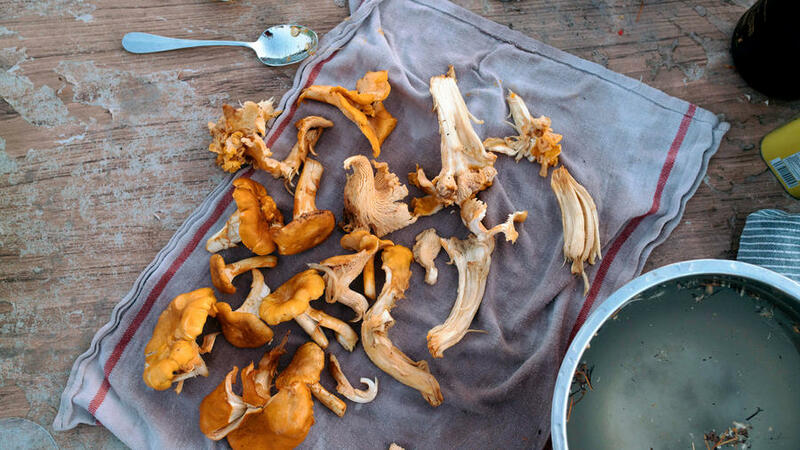 You’ll learn to identify the day’s haul, nibble on por­cini flatbread and sip local ­Pinot, and prepare your own gourmet mushroom feast complete with a dessert starring … more mushrooms. The local candy cap variety has a maple flavor that’s the perfect addition to bread pudding with tart cherries. ; from $129; Nov–Mar. Cocktails. Cedar needles. Fennel fronds. Mugwort. By the time you exit the Oakland’s Five Flavors Herbs, where botanical mixologist Brian Wallace’s Foraged Cocktails Workshop is held, you’ll know how to use local, booze-friendly plants to infuse your own spirits, vermouths, and bitters. Wallace encourages you to “make friends with the plants.” You’ll also smell them and crush them and drink them, in this two-hour class, which starts with the mechanics of cocktail infusion and ends with an absinthe bitters-making session, with breaks for earthy tipples in between. f; $75. Acorns. What do pancakes, brownies, and burgers have in common? They can all be made from acorns. People are surprised, says Tucson-based herbalist John Slattery, because “even those interested in wild foods consider them inedible.” Slattery crushes that myth in All About Acorns, a daylong course that traces the acorn’s journey from park to plate. Students get hands-on with the southern live oak, harvesting the nuts, shelling them, and making them into flour. “You can take a gallon of acorns and turn it into ready-to-use flour in two hours,” says Slattery. The day ends with an acorn-based feast. ; $98; Nov 19. Seaweed. In her three-hour class on the NorCal coast, seaweed forager Heidi Herrmann immerses you in the mysterious world of sea vegetables. You’ll harvest a half-dozen varieties, from nubbly bladderwrack to cellophane-thin nori to glistening ribbons of kombu (which makes for a terrific soup thickener). By the time you finish, you’ll have a huge haul of seaweed to take home, along with tips on how to dry and use it. The most amazing thing? The slippery carpet you’ve been walking on all day won’t look like washed-up ocean debris. It’ll look like dinner. ; $90. Natural dyes. You’d be surprised at how many bright colors you can get by simply cooking up a few roadside weeds. Wild-Craft Studio School will teach you which plants create natural dyes for making textiles. Regular classes are offered at their White Salmon and Portland, OR, studios; or come back in spring for the Coastal Dye Plants course in Netarts Bay, a weekend’s worth of beach camping, bonfire-based cooking, and hiking through wildflowers. ; 1-day classes from $160, weekend trips from $330.